In memory of Hubert Ritter (1886 - 1967), the architect of the "Westbad" (western public bath) in Leipzig, who introduced the geometry of the circle in house building, I have built a mosaic, that calls to mind the old roman bath places (thermals). I understand it as a fragment of an intended giant mosaic, that could have be seen in the WESTBAD in its faded glorious times. Just like the roman thermals this building is a ruin today. 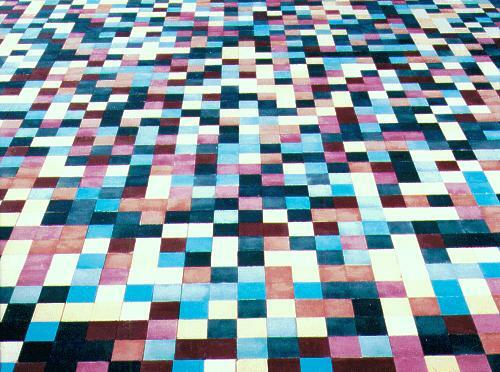 The mosaic shown evokes Hubert Ritters work and his passion for the circle in architecture. I ordered 1886 bricks, colored the surface in 10 different colors and put them into a matrix 41 rows x 46 columns. The succession of the colors is defined by the first 1886 digits of Pi. Every digit has its own color, from 1 - yellow, 2...9 - ochre and blue tones to 0 - dark blue. It is possible to "read" this mosaic by the line from left to right (beginning in the top left-hand corner to the lower right-hand corner). 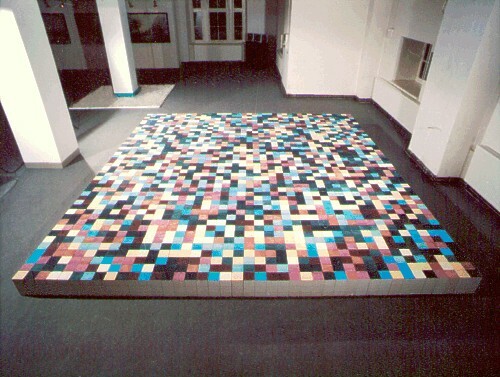 This mosaic, the biggest ever created on the circle number Pi, has dimensions 4,7 m x 5,3 m (185 inches x 209 inches) and a weight of 9,5 tons. It was built in 36 hours by the author. 7. 11. 2298 n. Arc.